LOL The dancing man is now flying in vineyards around the country! After years of searching for devices to scare birds, they have a HIT with these silly guys… sure makes wine-making a lot more silly and fun!!! 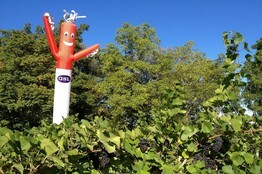 On loan from a government-funded research project, Mr. Pinot and a handful of other inflatable “dancing” tube men—the kind often seen at auto dealerships—wiggled above four wineries in New York’s upstate Finger Lakes region this year, as well as at some blueberry farms there and in Michigan.